WASHINGTON (Sputnik) - US government officials should stay away from Paris and other French cities over the coming weekend because of expected Yellow Vest protests that could turn violent, the US Embassy in France said in a security alert issued on Thursday. "Weekend demonstrations by the 'Gilets Jaunes' (Yellow Vests) are expected to continue March 23-24, and could turn violent", the alert said. "The US Embassy is advising official US government travellers to avoid travel to Paris and other major cities in France over the weekend". The US embassy noted that during previous demonstrations, looting, arson and other forms of property damage occurred in populated tourist areas the country. Americans who are in France should also expect traffic interruptions as protesters have in the past set up barricades at highway toll stations. The wave of the yellow vest rallies started in France in mid-November over planned hikes in fuel taxes. 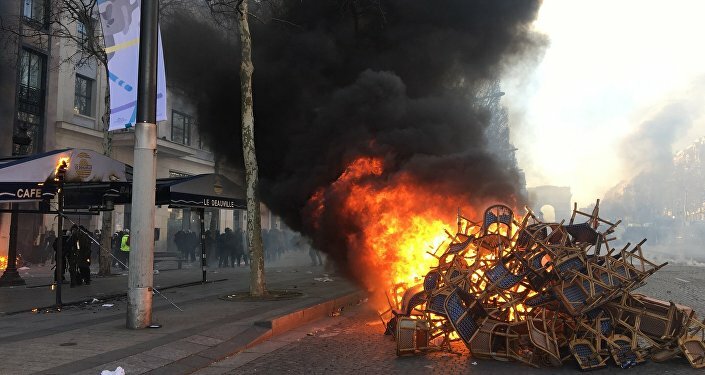 While the French government abandoned its plans to raise fuel taxes and introduced other measures to improve the country's socioeconomic situation, protesters continue to take to the streets across France every weekend for demonstrators to express their discontent with government's policies.